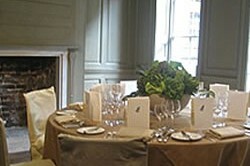 Located in the heart of London, just steps from Trafalgar Square, Benjamin Franklin House is a unique venue for corporate and private events, including elegant lunches, memorable receptions, lectures, dinners and wedding receptions in an exquisite 18th century setting. 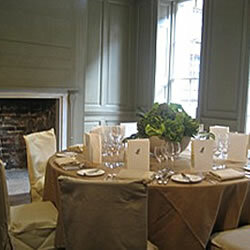 Two stunning rooms that can be used separately or jointly for receptions, lectures and dinners. Floor to ceiling windows with Juliet balconies and period shutters provide an exceptional setting.Capacity (using both rooms): 34 sit down dinner, up to 40 reception. Mirroring Franklin’s rooms Mrs Stevenson’s rooms are the perfect setting to receive your guests and offer them a welcoming drink. Capacity (using both rooms): 25 sit down dinner, 30-40 reception. Events can include a free talk or tour of the House by a senior staff member. Presentations can be tailored directly to your company’s interests, reflecting Franklin’s many pursuits: from diplomacy, Anglo-American relations, and finance, to science, philosophy, journalism, music, literature and letters.